Ideal’s Roanoke showroom sits right next to Montano’s Restaurant in the Town Side Plaza shopping center. Our floor to ceiling glass front gives patrons an enticing sneak peak at any time of day. 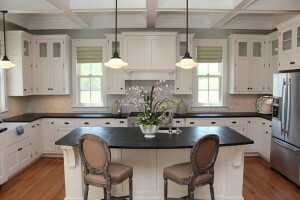 Once you enter, the first kitchen display to greet you is undoubtedly our client favorite. This Wood-Mode kitchen showcases inset doors with a Vintage Lace finish. The Siena Boudreaux granite countertops sparkle underneath our crystal chandelier and the ivory tumbled travertine backsplash is the perfect finishing touch. Our second front display is a sleek, modern design with a java and smoky brown pear finish. This display is topped off with a colorful glass backsplash and contemporary Hafele hardware. Just around the corner you will see our Italian Country inspired kitchen with a unique crackle finish on ivory Wood-Mode cabinetry. To its right is an elegant Wood-Mode china cabinet with mullion glass and diamond paneled doors. This display is finished off with LED lighting that helps showcase the china that is placed inside. On the far left side of our showroom you will find examples of our additional cabinetry lines. 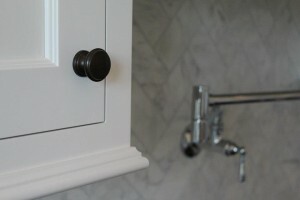 A stylish bar and two vanities help showcase some of the door styles and finishes they each offer. Down the hall is our granite, quartz, solid surface, & laminate sample room. 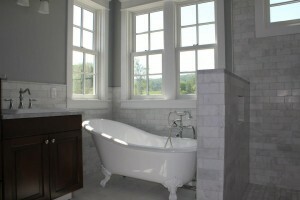 We carry multiple levels of granite and a variety of quartz manufacturers which help us provide options for all budgets. Our experienced and talented staff can help guide you toward the best surface for your design and life style. 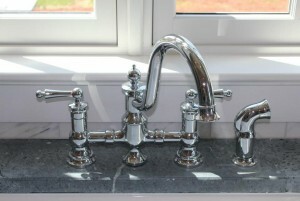 Lastly, you will not want to overlook our second front showcase which displays our Brookhaven and Wood-Mode vanities. The Louie Philip curved drawer fronts on our white make-up vanity add an interesting custom element and the crystal hardware is sure to impress. On the adjacent wall you will find a traditional single bowl vanity design with a vintage grey finish and a white Carrera marble top. Its furniture feet and matching mirror frame help showcase the customization that you can add to help any piece become your own unique design!